Real Estate has become increasingly complex and to take better control over the real estate business, ERP Software for Real Estate has been arose to improve results through a unified cloud based business solutions. RealERP is a one stop shop for all the real estate needs. We think that the combination of technology and market expertise with the matchless service delivery, enables companies across both private or public sectors to utilize new technologies and gain profits. As many of the real estate businesses faces several challenges in diverse areas of their business in the process of project planning and execution. Therefore our Real Estate Business Solutions provide the business with complete project management, investment management, construction & development, document management, accounting management, everything to make your life easy. As there are too many projects, clients, brokers, properties and other things, our real estate solutions help the real estate business activities, by organizing the overall process. Make it easy for you to bring all the information for you under one roof, to have a clear view and better control over your whole real estate process. Helps you connect with all your functional key areas of your business, bringing front-office and back-office operations on a single platform, so you can manage every aspect of your business with unparalleled efficiency and ease. Our powerful ERP Software for Real Estate offers real estate management which enhances managerial and business efficiencies, also helps in increasing profit in a cost effective manner. The software handles and secure all the information and process from the pre to post implementation of a project. Our ERP Software for Real Estate implements features like security, scalability and user friendly. 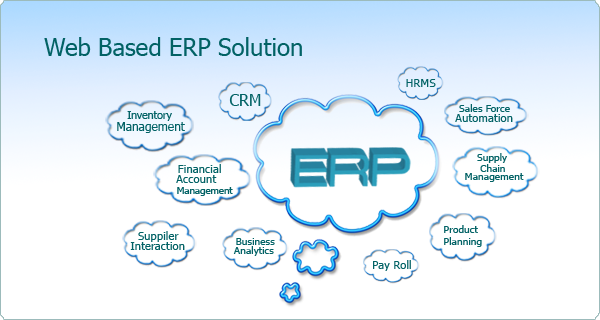 Allows a company to give proper attention to their business while the ERP Software will manage the whole project management.